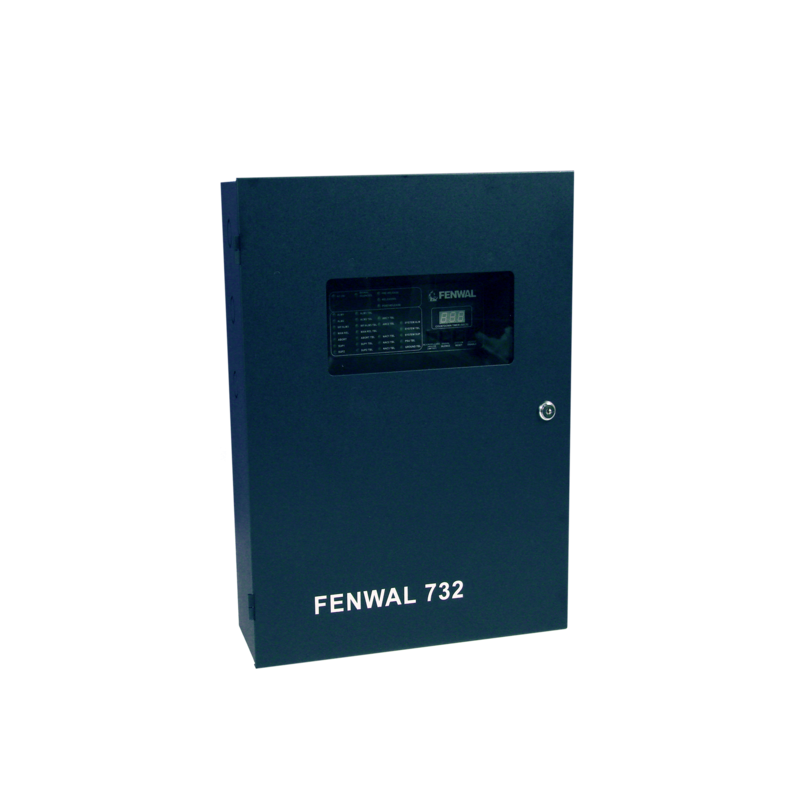 The Fenwal 732 is today’s most technologically-advanced conventional suppression control panel. With built-in Class A supervision for all circuits achievable without additional hardware—the range of circuits on the Fenwal 732 deliver programming flexibility unmatched in the industry. This streamlined panel fits effortlessly between the studs of a 16-inch standard wall with the ability to house two 12 VDC, 12 AH batteries and allow two-inches of wiring and finger space between the circuit board and cabinet wall. Prudent engineering makes the Fenwal 732 spatially and financially economical, as well as easy to install, maintain and use. The Fenwal 732 is the perfect panel for small- to mid-sized special hazard applications and can be used to control Fenwal’s full line of suppression systems. However, the options are not limited to FM-200®, 3MTM NovecTM 1230 Fire Protection Fluid and Argonite®, the Fenwal 732 is compatible with sprinkler supervisory, deluge/pre-action, foam and foam/water systems as well. Equipped- Commanding a full complement of 7 Input Circuits (3 Detection, 2 Supervisory, 1 Abort and 1 Manual Release,) 3 sophisticated Notification Appliance Circuits, 2 independent Agent Releasing Circuits and 4 Relays—the Fenwal 732 can handle all special hazard extinguishing applications with a high degree of programming flexibility. Effective - Armed with a 5.4 Amp Power Supply Unit and a battery charger capable of powering a 68 AH battery, the Fenwal 732 can provide up to 90-hours of standby supervision plus 10-minutes of alarm—as required by some authorities. This ensures the continuous fire protection necessary in modern high-tech, industrial environments—even in the event of a loss of power. Economical- Power-limited circuits (excluding Agent Releasing Circuits) allow all wiring be run Economical through the same conduit, reducing material expenses. In fact, even the Agent Releasing Circuits can be made power-limited (except with Initiators) by using an external in-line diode device. Backwards compatibility with the full range of Fenwal conventional detectors, alarm devices and suppression accessories allows replacement of older generation panels without the cost of replacing other system components. Triple-R™ Protection - This triple redundancy process ensures electrical disturbances, such as power surges, do not inadvertently activate the suppression system resulting in a more reliable suppression-focused panel. Release Countdown Timer - An easy-to-read release countdown timer alerts you to precisely when the system will discharge. Battery Voltage and Charging Display - Read the open circuit battery voltage and the battery charging current on a working panel without disconnecting the batteries or using external multi-meters. Password Protection - Set a password when your panel is installed to prevent unauthorized access to your suppression system. Factory technical support can assist users with forgotten passwords. Extensive Diagnostics - The troubleshooting function displays diagnostic codes to help identify the source of a problem. A complete list of diagnostic codes and their meanings can be found installed on the inside of the enclosure door for easy reference.